Happy October! Now is the month to obsess about cold snaps, crunchy leaves, warm tones, halloween shopping, and pumpkin flavored everything. It's also apple season. Before everyone became so enthralled with the idea of pumpkin and pumpkin smell and pumpkin spice, and consuming as many pumpkin products as possible, I seem to remember apple used to be the flavor of Autumn. Remember apples? 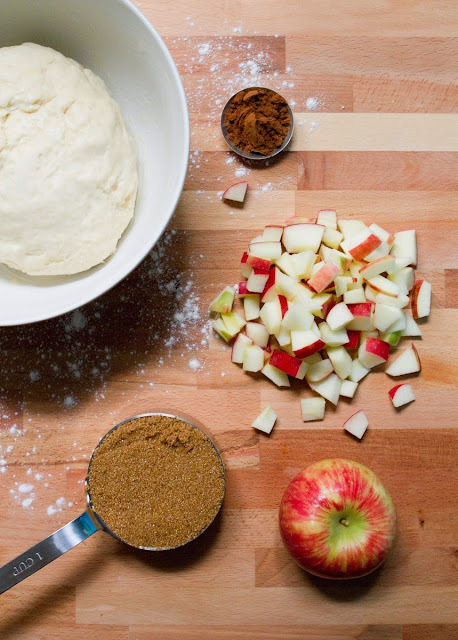 Apple pies, apple crisps, apple cider, apple picking- apple used to be Autumn's signature food. Don't get me wrong, I like pumpkin, I buy a cute little sugar pumpkin every year and turn it into a pie at Thanksgiving. And I like pumpkin flavored things, too. I just think it's silly that we've all forgotten how lovely and Autumnal spiced apples are because these days by October 1st nearly all of America seems to be afflicted with the plague of Pumpkin Spice Madness. This is apple season. There is no better time of year to crunch into a Gala, Pink Lady, Jazz, or Golden Delicious. My personal favorite, which I used in this recipe, are Honey Crisp. Sweet but also a bit tart, juicy, and super crisp- these are my favorite elements of a good apple, and most Honey Crisps have them all. These buns are delicious. 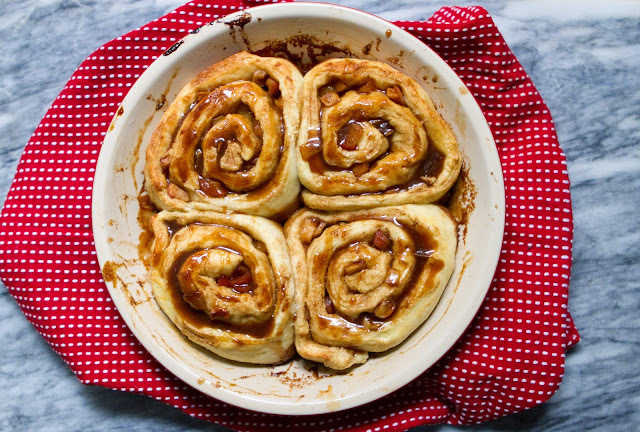 They're made from my favorite dough- pretzel dough, and filled with cinnamon spiked caramel and diced apple bits. 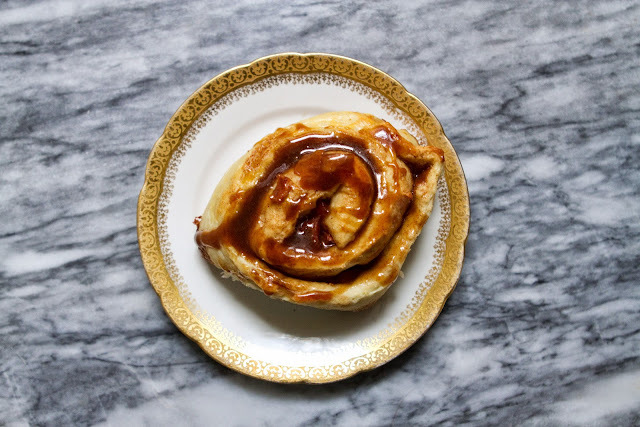 The sweet-salty dough pairs amazingly with the salted dark caramel and juicy, sweet little apple bites. 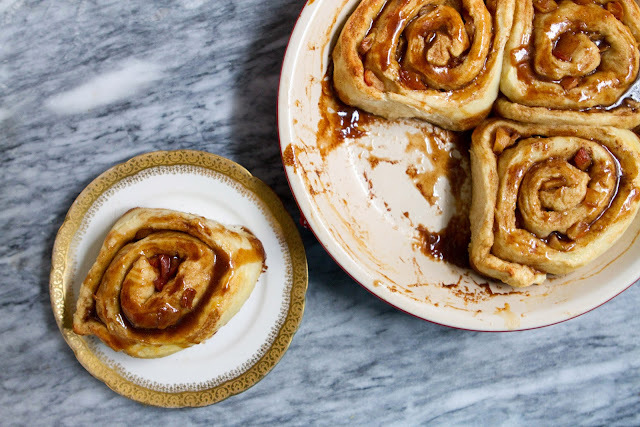 These are hefty buns, and the recipe will make twelve, enough for a brunch, a bring-along to a party, or a large family gathering, but probably way too many for your immediate family on a Sunday morning, so feel free to cut it in half if needed. I would use two apples in a half recipe though, rather than 1 1/2. Nothing wrong with a bit of extra apple. Enjoy! Pour warm water into the bowl of your standmixer (or just a mixing bowl), sprinkle package of yeast over the water and let sit for 8-10 minutes, with the top of the bowl covered with a towel. combine flour, sugar, and salt in a separate bowl, mix until well combined. Melt 2 oz butter in small saucepan over low heat or in microwave. Once yeast has foamed up like the head of a beer add the flour to the bowl followed by the melted butter and 1 Cup water. Using stand mixer, or wooden spoon mix until a dough forms, adding more flour if the dough is too wet, more water if it is too dry. Once dough comes together, give it a couple of kneads, maybe five or so, then form into a ball and place in a lightly oiled bowl. I also rubbed my dough ball down with a bit of melted butter, but this is optional. Allow to rise 1 hour, or until dough doubles in size. I like to cover my bowl with a towel and put it in a warm place. 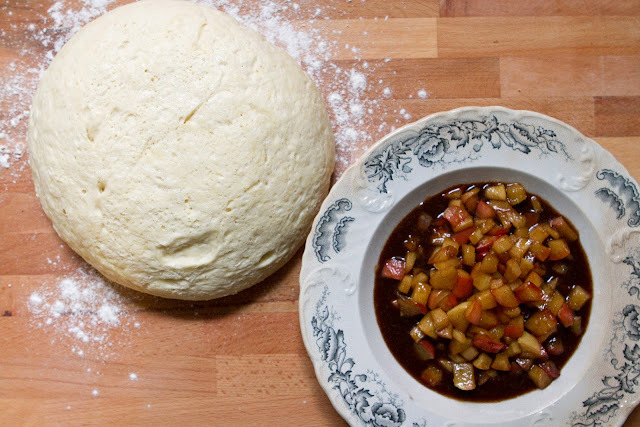 While dough is rising, chop the apples into 1/2" cubes. Melt 2 tbsp of butter in a frying pan and add the apples. Cook about about 5-7 minutes, until apples are soft. Remove the apples from the pan and place in a bowl. Add to the pan the remaining 5 tbsp butter and the brown sugar and cinnamon, cook together until the sugar is totally melted. Cook an additional 3 minutes to allow the sauce to thicken, then add the half and half, (warning, it will bubble up when added), and mix in well. Cook another 5 minutes, or until sauce is fairly thick. Remove from heat. Pour half the sauce into a measuring cup and set aside to be your glaze. Add the cooked apples to the frying pan with the other half the sauce and stir them together. Butter a 1/2 sheet cake pan, or other large rectangular pan, or 3 pie pans. Once dough has risen, preheat oven to 425 degrees. Remove the dough from bowl and place on a lightly floured counter top. Using a rolling pin, roll dough out to be about 3/4" thickness, in a large rectangle. Spread the apple/caramel mixture over the rolled out dough in an even layer. Beginning with a long edge, gently roll the dough into a log. Some caramel will probably escape, don't let this worry you, there's plenty inside. Once you have a long dough log, slice it into 1 1/2 inch segments, and place each one in the buttered roasting pan. Brush down the tops and sides of the rolls with the egg yolk/water mixture, then bake for 15-20 minutes, until golden brown on the outside and cooked through. 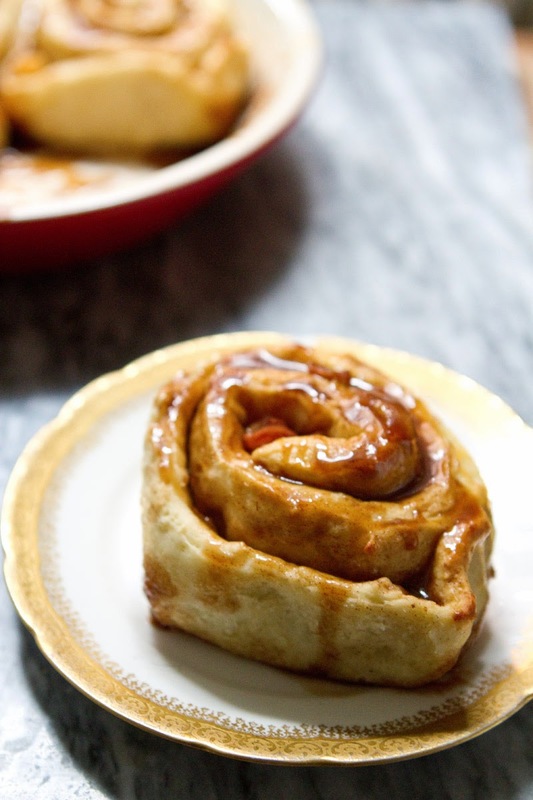 Allow to cool for about 5 minutes before drizzling the rest of the caramel glaze over top of the buns, and enjoy!